More revelations on the UK Council for Psychotherapy’s bungled fitness for practice hearings into John Smalley, a Jungian analyst with the Independent Group of Analytical Psychologists. And believe me, this one’s a corker. The story so far…The UKCP took over three years to investigate complaints about Mr Smalley, a Jungian analyst with the Independent Group of Analytical Psychologists. At the end of a long sequence of delays, they decided that seven allegations had been proven, but also decided not to sanction him. The fact that he admitted in the hearing that he destroyed his notes doesn’t seem to have prompted a sanction. The UKCP’s laughable response to this is that they didn’t sanction him for destroying his notes because there wasn’t a complaint about destroying his notes. In my last post we discussed one of the proven allegations – that Mr Smalley inappropriately tried to set two of his clients up in a business partnership with each other. Smalley claimed to have given them a strict set of conditions to avoid the business relationship impacting on their therapy, but since his notes were destroyed, there was no evidence to corroborate this. And the other one…well, let’s take a look. 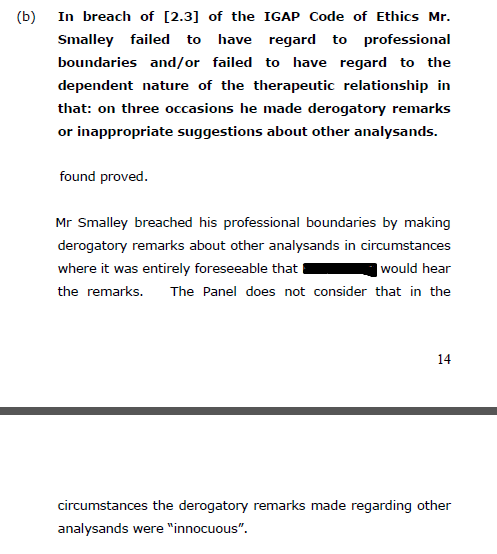 Here’s the incident being discussed by the complainant, and the response by Smalley’s barrister. Now, this is on a different order altogether. As with so many of the allegations in this case, the complainant and Mr Smalley had wildly differing accounts. However, even if one accepts the barrister’s account as being true, and all he said was, “You might want to hang around, I’ve got an attractive client next”, then even as an “innocuous” joke that would be totally inappropriate. And if the complainant’s account were accurate….well, then that would be dodgy as hell. So, Mr Smalley set up the complainant in a business relationship with one of his other clients, and talked about setting up him up in a romantic relationship with another fellow client (albeit possibly jokingly). Arguably, such actions could be interpreted as slightly cultish. So, what were the UKCP Panel’s findings on Mr Smalley’s remarks? Not so innocuous after all, then. But hang on a minute, the UKCP still managed to not apply a single sanction to Mr Smalley. Not even a caution. What did they have to say about these not-so-innocuous remarks when they made their decision about sanctions? And that seems to be more or less it. All that stuff about time management sounds far more relevant to the more minor “silly bugger” incident than the one where he’s suggesting the complainant hang around to catch a glimpse of an attractive woman who’s coming to therapy. Utterly pitiful decision. Fun fact: As this website shows, John Smalley used to be chair of ethics for the Independent Group of Analytical Psychologists. This entry was posted in Uncategorized and tagged igap, john smalley, regulation of psychotherapy, ukcp, Uncategorized. Bookmark the permalink. It also shows that the rest of the IGAP committee at that time were all… women! Phwwoooar! I wonder if Smalley invited his friends or patients round to the committee meetings to get a look in? Nudge nudge wink wink. Silly bugger. “…reflected on this…” Dear me, what a bunch of twats. Would that be your reflection? And the proven behaviour of Smallpiece? Well we have leering at clients, passing remarks about their attractiveness to other clients, breach of confidentiality, trying to set up a business relationship between clients and a failure to keep notes. Each of these grounds of complaint, if proven, might be enough by themselves to trigger serious sanctions by the NMC. I think that we can say with confidence that taken in their totality a mental nurse in a like for like situation would be struck off. The response by the UKCP is to talk about a “salutary” lesson and take no further action. My considered reflection is this: Mr John Smallpiece is a scuzzball and the UKCP are truly a bunch of twats. I can also tell you that there is no way that a lot of UKCP organisations will even sign up to a CHRE kitemark standard; limited as it will be it is just too challenging for them. No, he was not suspended, and continued to advertise his services on the IGAP website throughout the process (I believe in the course of the hearings he resigned from the UKCP, so is no longer on their register, though he’s still on the IGAP register). I don’t have a copy of the IGAP code of ethics, even though I e-mailed them asking to see it. I though his name was Smalley. In several of these posts, the language used diminishes the argument. It would be good to have a reasoned debate and not descend into vitriol. I write this because due to the focus on the allegations, and people’s response to them, one can easily overlook other aspects and attributes of Mr Smalley. Firstly, I worked with Mr Smalley over a period of two years, for two sessions a week. He s a challenging, at times tough, analyst, who has devoted many years to the exploration of dreams as a path to individuation. Mr.Smalley has a strong sense of humour and his language can be salty. That is who he is. He is also a loyal and caring man. Secondly, maybe culture needs to be considered here – Mr Smalley comes from a working-class background, where language is used in a very direct way,and often in banter. I, too, come from a similar background, where certain words and phrases have particular weights and meanings. We have to learn the language of different classes, and not rush to offence.. There are certainly matters for concern, but I hope that Mr Smalley is not pursued, rather called to account; and I hope we remember that suspension or removal from a register is a matter of livelihood, and not to be undertaken lightly. While I wouldn’t deny that Mr Smalley may have some redeeming features as a therapist, there have clearly been some very serious issues raised, and I don’t think his working class background by any means explains all of them – the described incident where he’s allegedly talking about an attractive female client could raise issues of boundaries and/or confidentiality. Also there’s the destruction of notes, which would normally be a fitness to practice issue in and of itself. It’s worth remembering that regulators like the GMC or NMC have a range of sanctions that can be applied that don’t necessarily involve striking someone off. A caution order for example, or a conditions of practice order, which might not mean the end of a practitioner’s career. The UKCP could have applied one of those, but chose not to for reasons that don’t seem very clear. The question is: Why does the UKCP cover for the analyst? What is it about this analyst that makes the UKCP throw away all their ethical guidelines and rules, no longer protects the public only to cover one guy??? WHY? The same question I am asking myself right now. The BPC seems to be doing everything to protect this analyst when it is obvious she has acted unthical and unprofessionally.